To access the order, go to app.provi.com and locate the order by navigating to Orders in the header at the top of the page and locating the specific order. Once you click on the order, you will be taken to the Items tab, which provides you with all information associated with the order. Once you reach the end of the order you will see the option to Accept the order or Reject All Items. Click on Reject All Items. 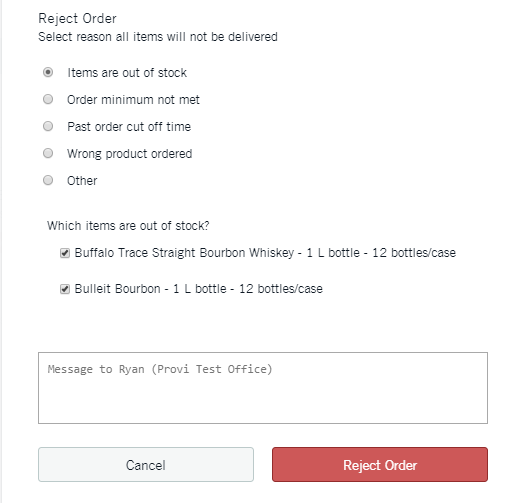 Once you click Reject All Items, an additional window will pop up prompting you to provide a reason why the entire order is being rejected along with a text box to provide any additional information to the retailer. Once you reject the order, the Retailer will be notified via SMS and email of the rejection. The notification will provide them with the reason why the order was rejected as long as any additional notes you provide. Please note that once an order is rejected, you are not able to undo this action.